Diversifying: Late night's Jimmy Kimmel latest to get game show gig. Comedians are making a gold rush to game shows, with Jimmy Kimmel the newest to try his hand. Starting July 20th, Kimmel will host ABC's Set For Life, in which contestants get shots at winning monthly paychecks for up to 40 years. The network says no skill is required. "It's all about knowing when to stop, and about bringing along a trusted 'guardian angel' advisor who will ensure you go home a winner." 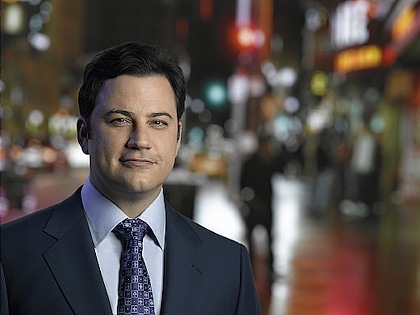 Kimmel, former sidekick on MTV's Win Ben Stein's Money, is following in the footsteps of Howie Mandel (Deal Or No Deal), Bob Saget (1 vs. 100), Penn Jillette (Identity) Dennis Miller (the upcoming Grand Slam) and other funnymen turned quizmasters. ***Reprieved for a seven-episode return in mid-season, CBS' Jericho will restart at the beginning on July 6 with a repeat of the series' pilot episode. Subsequent episodes, beginning with No. 12, then will air on Fridays at 8 p.m. (central). ***ABC is adding John Larroquette to the cast of next season's Boston Legal. He'll play a new partner in the firm of Crane, Poole & Schmidt. And The CW's Smallville will put Supergirl in play when the series returns. An actress hasn't been cast yet. ***Viewers were too busy buzzing about the controversial finale of The Sopranos to show much interest in HBO's immediately following premiere of the bizarre John From Cincinnati. It plummeted to 3.4 million viewers after 11.9 million watched Tony click to black. Lifetime's second episode of its new Army Wives drew 3.3 million viewers opposite John From Cincinnati. ***Sign of our times: NBC Universal Television Studio no longer has the word "Television." It's now Universal Media Studios. New co-entertainment president Ben Silverman says the name change "reflects our TV studio's natural evolution, as digital distribution expands and more platforms need premier ideas and programming." The first allegedly premier idea under the new name is a deal to produce an English language version of the telenovela Sin Tetas No Hay Paraiso (Without Breasts There Is No Paradise). It's earmarked for NBC, with a Spanish language edition with a different cast being made for Telemundo, a Universal property. "These synergistic productions represent a giant leap forward for the networks of NBC Universal. I scour the world for the best ideas and for the game-changing hit shows," Silverman says humbly in a press release. Earth to Big Ben: "Synergistic" is such a yesterday word. It's almost as outdated as "television."